From route 101 turn onto route 122 south (Ponemah Rd). Follow Ponemah Road for 3.0 miles and turn right onto Hayden road. Follow Hayden road for 1.7 miles to a gravel road on the right. Parking for 1-2 cars can be found at the entrance to the gravel road. From the gravel road parking area on Hayden road follow the snowmobile corridor north 500 feet and bear right at the Y intersection. The road descends along the contour line of Birch Hill crossing 2 bridges then merges with a gravel access road after 0.4 miles. Bear left ascending the moderate grade, well packed with good footing tower access road. After 0.5 miles you reach a recently cleared and logged area and the sub summit of Birch Hill as the access road merges with snowmobile corridor 501 and continues north. In another 0.1 miles you obtain your first view of the "fire tower" near the Birch Hill Summit. The "tower" is an additional 0.25 miles ahead. I put "fire tower" in quotes because once you reach the "fire tower" you soon realize it really isn't a fire tower. The structure is a cell phone radio tower disguised as a fire tower. It's an interesting feature and unique way to disguise the cell tower. Pass the tower and follow snowmobile corridor 501 as it makes a Y turn to the right (north) for 0.15 miles through a newly clear cut logged area. From here it's a 500 foot bushwhack to the Birch Hill summit. The viewless summit has a definite distinct bump. There are no markings at the summit however 2 large white pine trees stood near the highest point. 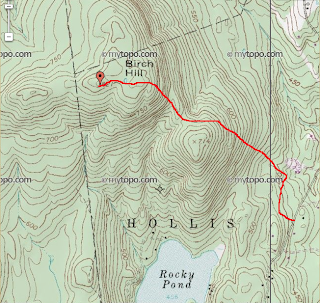 Birch Hill is the 33rd (of 37) highest point in Hillsborough county and 641 (of 648) highest peak in New Hampshire. 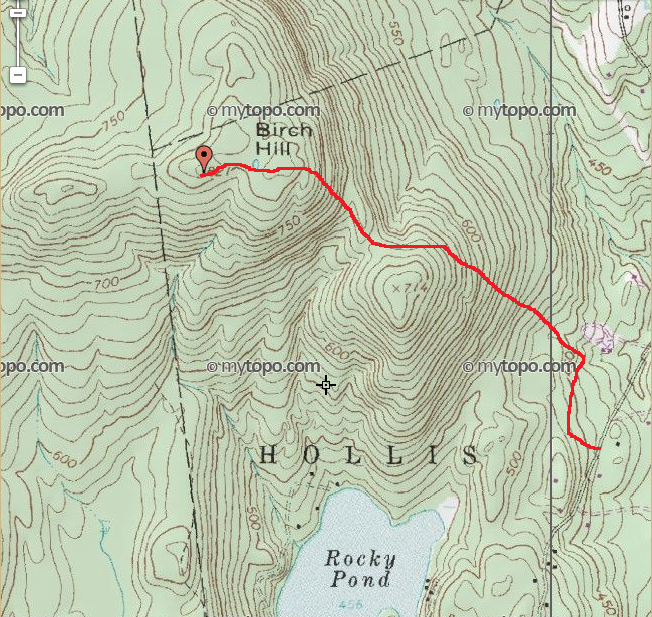 The Birch Hill summit is the highest point in the town of Hollis and a point on the western summit (810 feet elevation) is the highest point in the town of Brookline. I made a slight error with my calculations of the Brookline highpoint and inadvertently went to the highest point on the Hollis / Milford town line thinking this was the Brookline high point. Unfortunately I didn't realize this error until I returned home and evaluated the maps. The western summit can be accessed by Summit Lane and may be located on private property. The area is peppered with snowmobile trails and corridors managed by a snowmobile club called the Hollis Nor'easters. Unfortunately maps aren't accessible to view without membership. The hike is straight forward and bushwhack relatively easy. There are no views from the Birch Hill summit however limited views to the southeast are available from the tower access road.